Mix together and knead until smooth. Add food coloring if desired. Make shapes and bake at 300 degrees until set and golden (1/2 hr to 1 hr). For a more golden appearance, paint with a beaten egg when it is almost done baking and looks dry. You can paint with egg twice or three times for a darker golden color. Don't use egg on colored dough. For colored dough, paint with shallac or laquer after baking. If cracks appear, patch with some slightly moister dough and continue baking. Making decorations with Baker's Clay is limited only by your imagination. It's just like working with clay! Snowman - roll three balls ranging in size from small to large. Attach head to belly by "scoring" lightly (make very small scratches in surface of clay) and brushing with water, then press the two pieces together gently. Attach belly to bottom in the same way. Teddy Bear - roll two balls, one small and one medium. Attach as above. Roll four small cylandar shapes with flattened ends for the arms and legs. Attach to body as above. For the ears, pinch the top of head with thumbnail. Wire hook - Use needlenose pliers to bend the end of a 2" piece of wire. Insert straight end of wire into the top of your shape, leaving the hook and about 1/4" showing at top. Bake - Place shapes gently on cookie sheet. Bake at 300° until set and slightly golden. Paint with a beaten egg when almost done baking for a golden look. For colored decorations - use food coloring in the dough. (Don't use beaten egg on colored dough.) OR, simply paint with acrylic after baking and cooling, then use shellac to seal. 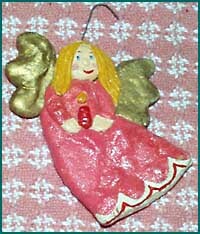 You can also shellac a plain ornament, and then spray with gold or silver spray paint for a sparkling appearance. If properly sealed with shellac, your ornaments should last for years. Be sure to store in a dry place.